Liverpool will always take a point at the Emirates, it as good as a win for the northerners on Monday night. Time wasting from the Merseyside team after 50 minutes was evidence of just that, but they had their chances, as did Arsenal. While headlines will point to Cech as the one who literally saved Arsenal a point (and rightly so), Gooners will surely feel hard done by with the offside call on Ramsey's first half 'goal'. A lovely move capped with a nice, legitimate finish, but it was not to be. 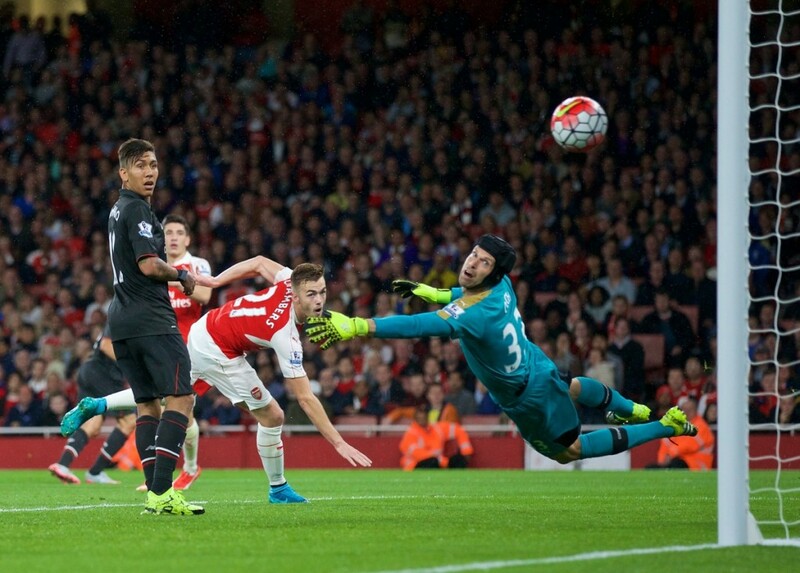 That was, perhaps one of the few moments of the match when Arsenal really found their rhythm. Although we've seen some progression with the team cohesion, it still feels like something is a bit off. Changing both central defenders, while intriguing, was perhaps not an ideal situation but one that turned out well in the end. I don't believe that we would have held onto that clean sheet with Szczesny or Ospina in net with Chambers constantly giving up possession in dangerous areas, and to be fair I think Cech owed us a strong performance. Calum Chambers is just 20 years old, and hasn't seen a starting spot in quite some time, so while he had an absolute shocker (with some improvement in the second half, although nothing significant) we can't dismiss his potential quite yet. Gabriel Paulista's performance was one of the the bright points of the evening and has surely made a case for a starting spot in the near future. Nacho Monreal was another that had a solid match, on top of his other encouraging performances so far this season. Being a Gibbs fan it's hard to see the young Englishman on the bench, but Monreal has earned that left back spot and I can't see him giving it up anytime soon. In the center of the pitch Santi had a rough time of it, uncharacteristically giving away possession more than we're used to seeing, but he's Santi, we'll see some magic form the little fella sooner rather than later I'm sure. On paper, Ozil and Sanchez strike fear into opponents and for good reason, but too often when they're both off the ball they seem to be making the same runs right into the top corner of the box usually. Giroud does a great job at holding up the ball in the middle, but it seems like he struggles to find an outlet too often and with the likes of Ramsey, Alexis, Ozil, Cazorla it's hard to imagine why. Our massive Coq up front showed a slightly different dynamic to his game Monday, demonstrating his ability to run and showing up all over the pitch. He was, as usual, our rock in the center of the park but against Liverpool we saw him in areas we don't usually see the big man. He seems like a player who's got a great deal of passion, so perhaps it was his frustration at the lack of creativity up front and wanted to lend a hand? Whatever it was, I liked it and it didn't take away from his defensive duties at all. 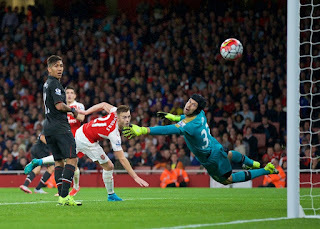 The Coq was up in everyone's face, pressing early and dispossessing efficiently. Someone made the comment at the bar that with a solid, regular back two in place Francis Coquelin has the ability to be a truly great leader in the Defensive Midfield position. He drops back when needed, which allows our full backs to make runs, yet he also likes to make an appearance at the top of the box every now and then. The only thing that scares me about him is his tendency to pick up cards (like a good DM does) and then what do we do? Arteta? Flamini? I thought we were passed that. An Arsenal team in the process of rebuilding can find players like those very useful, but this Arsenal team - an Arsenal team that should be fighting for the title... well, unfortunately they're just not good enough. It all comes back to signings. We can't fight for the title, plow our way through the cup competitions and be a real force in the Champions League without a really convincing back up for our Coq. Many fans and pundits are only talking about DM's to replace Coquelin, but I think we've got a good lad here and sufficient depth behind him could be invaluable in the long run. Strikers? We'll talk about them later, but in my opinion it's not a position we're particularly 'lacking' in. Could we add more quality? Of course, but I like Giroud a lot and hopefully once Welbeck returns form injury and gets a few games in he can be another good option for us. Progress is being made, but we haven't seen that 'click' yet. It's coming, we all know it's coming and it'll be as glorious as a Robert Pires life-size cardboard cutout when it happens. Can Newcastle give us that sweet, sweet release we all crave? Let's sign a solid DM this week, then find out Saturday.